Much like the Millenium Dome – or, as its known to those who don’t remember the twentieth century, the O2 Arena – the London Eye was built to celebrate the year 2000. But unlike the ill-fated Dome, the Eye was a resounding success, and it’s hard to picture London’s skyline without it. Actually, this astonishingly popular attraction boasts a mouthful of a title: the highest cantilevered observation wheel in the world. It’s hardly any surprise that tourists arrive in their hordes to climb on. Queues are generally pretty hefty; the ovular pods each carry a maximum of 25 people to a height of 135 metres. It rarely ever comes to a full halt – except for upkeep and to allow visitors who are elderly or have mobility issues on – so you won’t be standing on ceremony when you get on! Before you know it, you’re halfway into the sky and taking in the sweeping vistas of the Thames and wider London. Before that, though, you begin with a brief 4D film in County Hall to witness a series of dazzling aerial shots of the capital – a nice prologue to what you’ll see first-hand. The pods themselves are surprisingly spacious, which means you’ll be able to roam and find a decent view. And on a clear day, you can even catch sight of Windsor Castle in the distance. Oh, and if the Queen’s opened the curtains at Buck House. Thirty minutes later you’ll find yourselves back on the ground as the wheel completes one full rotation. The ride is smooth and steady, so any age will enjoy the trip – so long as they don’t have a fear of heights. The wheel is also entirely wheelchair accessible. 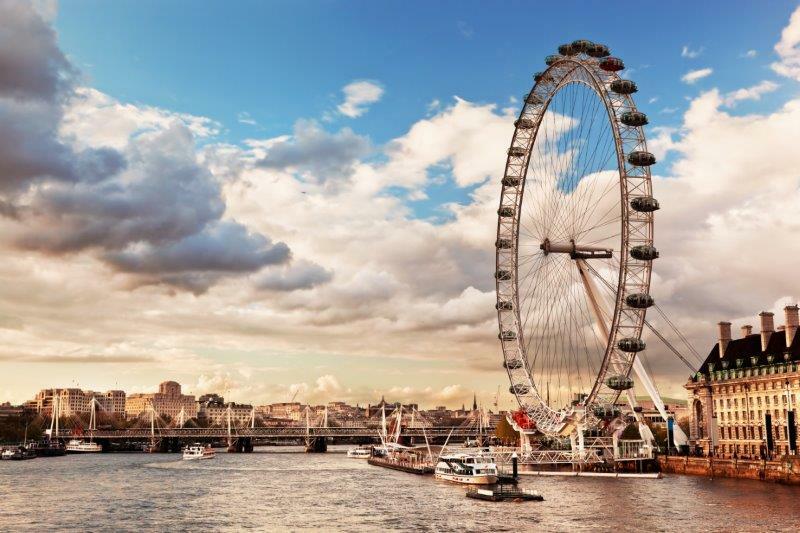 The popularity of the London Eye has drawn other attractions to the same stretch of the South Bank, between Westminster Bridge and the Golden Jubilee walk bridges. County Hall is a pleasure palace that houses a hotel, the Sea Life London Aquarium, the London Dungeon and Shrek’s Adventure London. Nearby Jubilee Gardens offers a chance for young families to run off steam after the queues and crowds, and the London Eye Pier directly below the wheel is a great place to jump onto one of the regular riverboat services that stop off at several points between Westminster and Greenwich.